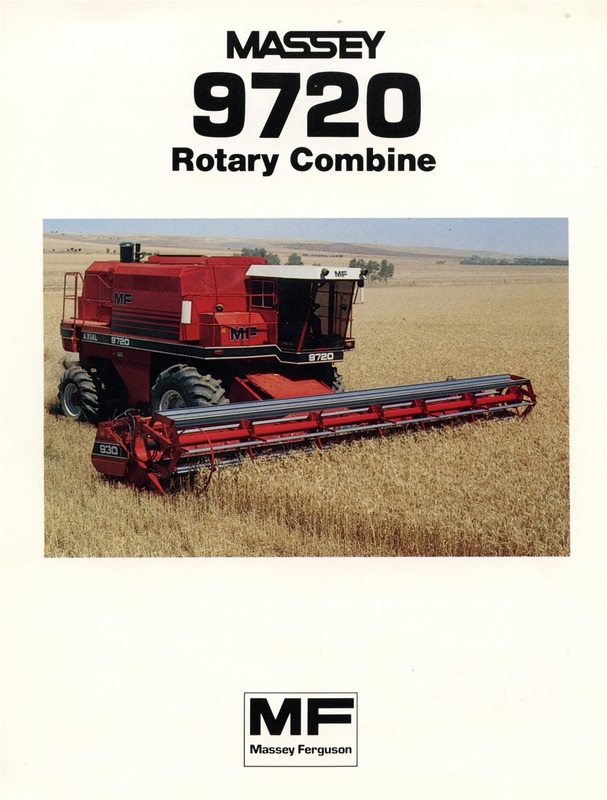 From the late seventies Massey had begun to develop their own rotary combine prototype, called the Tx 900 series, these machines had cylinder dimensions varying from 27 inch to 32 inch and carried the model numbers 901 902 903 with the Tx 904 being the largest with a capacity of 175% that of the current 760 model. 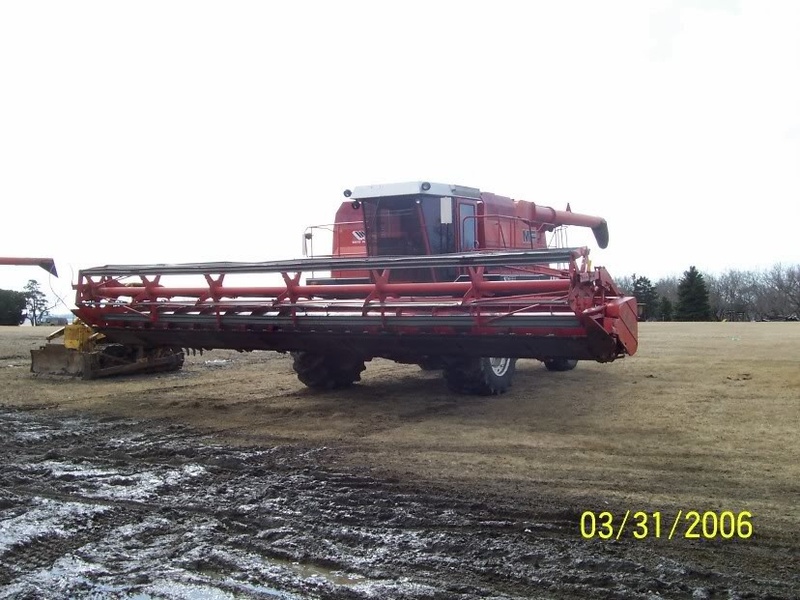 By Early 1985 these new models were not up to production standards, and with that and the huge amount of expense needed to finalise the combines for production ie re tooling the Brantford plant for as many as 8 models ! 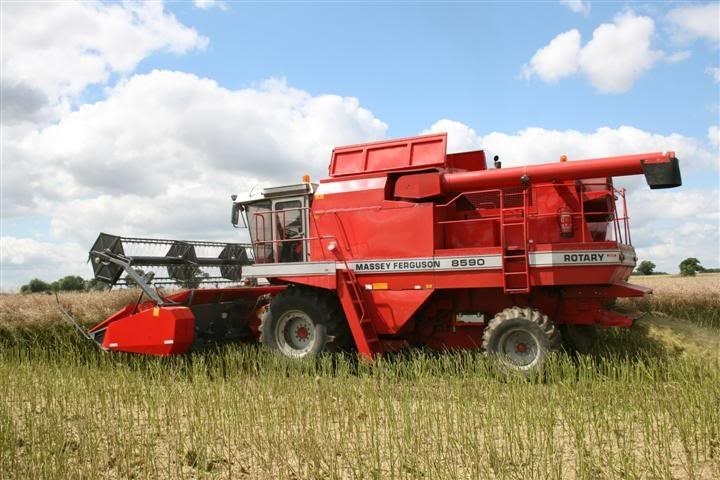 and two brand new combine ranges it was viewed as more prudent to buy into an already existing market ready design machine, and that came in the way of their neighbours White farm machinery who were litteraly two blocks away from the current plant! also at this time Massey had huge financial issues! 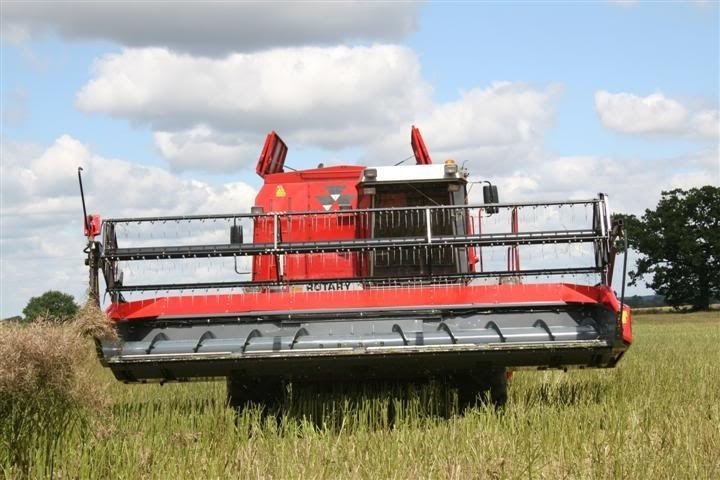 White had built up a fairly successful range of combines, and it was said their design was as close in several areas as the Massey prototype!It seemed more than likely that there was shared interest in this concept!!. It is said Massey had collaberated with White on the Rotary combines long before buying the bankrupt White company in 1985 for sure the radical steps away from a tried and trusted walker combination would not be easy but as information is freely available now Massey were in the background testing this concept but as you can imagine as a market leader with there walker machines it would not be a straight forward transition over to this concept and as history has proved it hasnt resigned the walker combines to the history books. According to research the Tx 900 had some serious problems with its design particularly its centre of gravity causing it to pitch when changing speed and direction! not only that Mf were very concerned that its output compared to other competitors machines could very much render it outclassed from early on in its life. However the Tx 904 was specified to have the biggest rotor to vastly increase capacity. Sadly the Mf Tx 900 rotary and Tx Conventional new model walker machines were shelved due to problems within the company and outside forces, and the merger of the two companies, the marketing of the White Massey badged platforms consisted of 8560/8570/8780/and 8590 this last model was only built in 1987 and its said only 100 models were made! and a handfull made it over to the uk for evaluation. 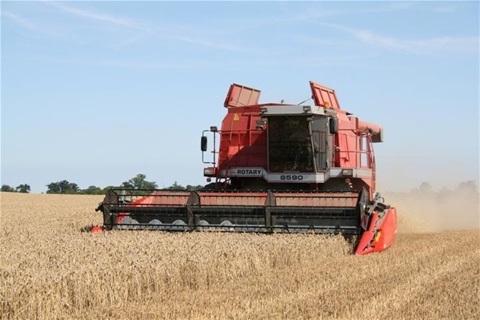 A couple of 9720s were apparently tested in England in 1986! the serial numbers of the 8590s that came to England were 90/99 there is 2 of these machines in a combine breakers in Northumberland and have been there for several years, the wherabouts of the others are not known although about a year ago a very rough one came up for auction in Northampton and went for breaking. 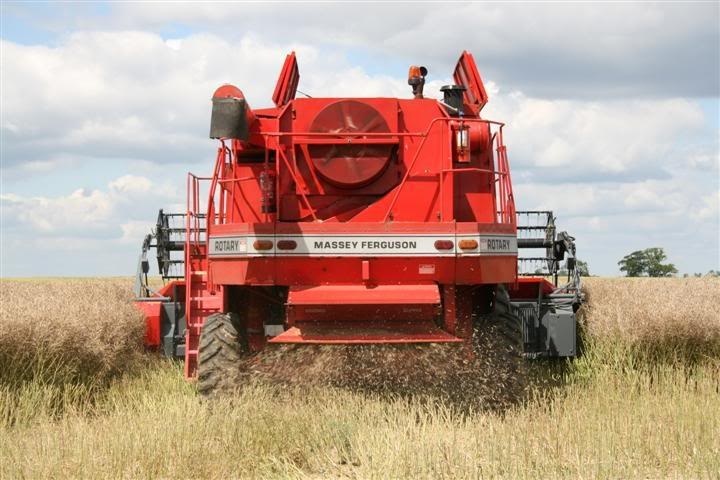 With a maximum rotor length of 163inches in its day it was the biggest capacity rotary combine available, also a 265 bushell capacity grain tank it was a seriously big combine! 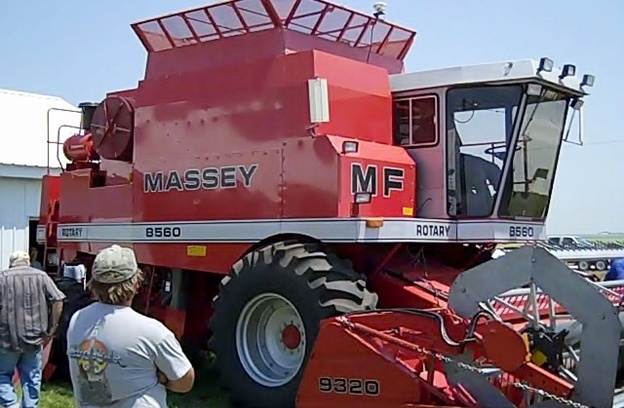 The company ended its reign with this model built at Brantford, you have to wonder just if things turned out differently what would Massey have in there dealers yards today.? 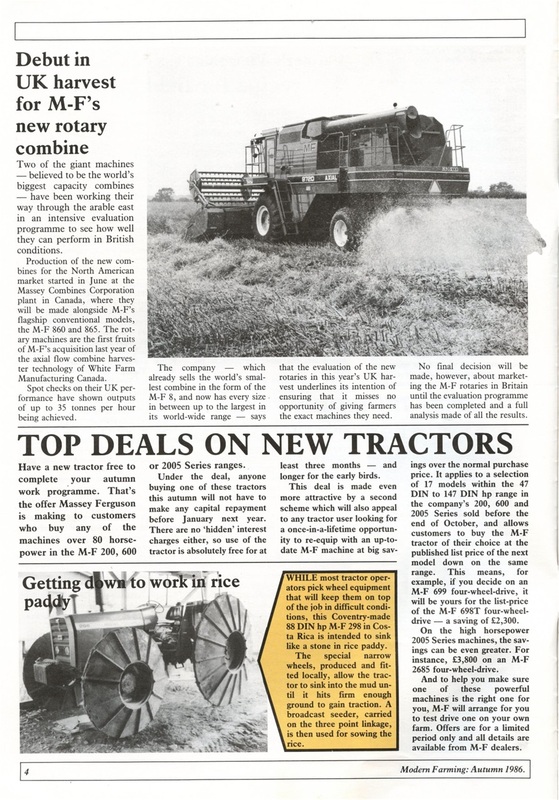 This is a trade press article about the Massey Rotary working in the Uk in 1986! This 9720 white model as produced by White before Mf Acquisition later rebadged the 8590. 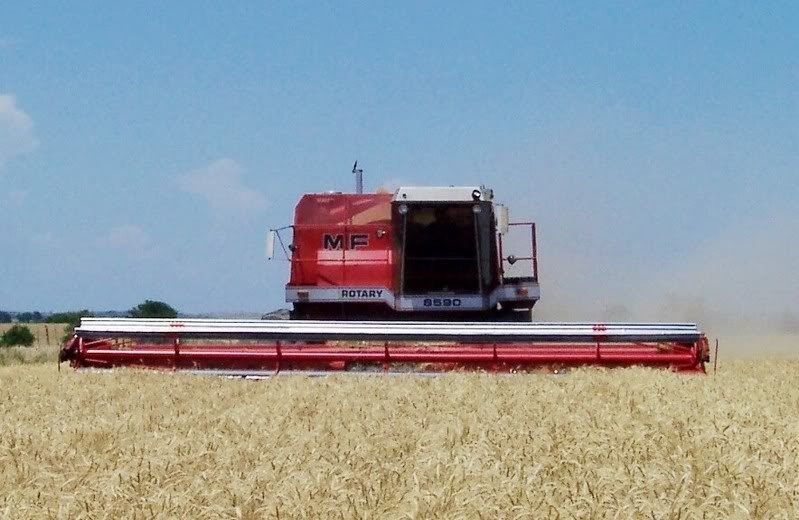 This is a white 9720 badged MF it belongs to Helland harvesting custom cutters. A 9720 brochure, some of the early Massey badged machines still retained the white decals!! 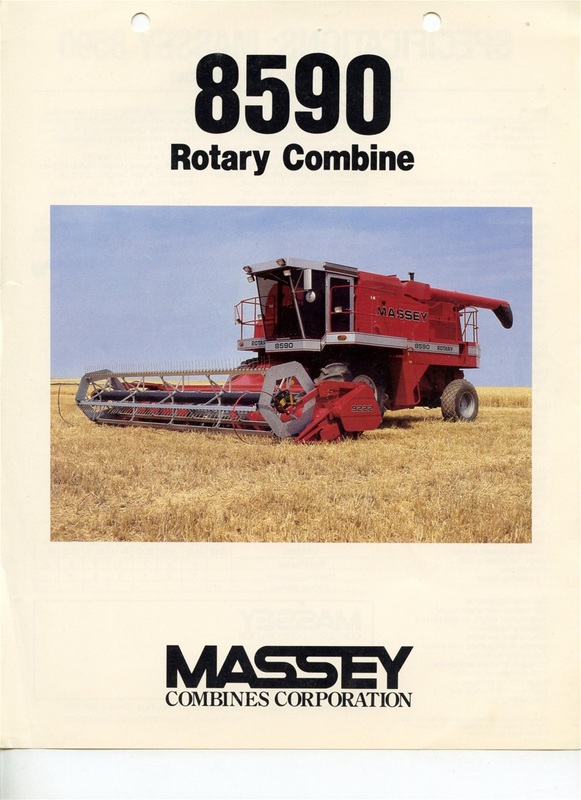 The later 8590 brochure, in the short period of time that Massey acquired the White combines, there were to be many changes and updates to improve the combine even further, but many owners carried out updates on there machines when they were purchased !! And after the closure of the company. 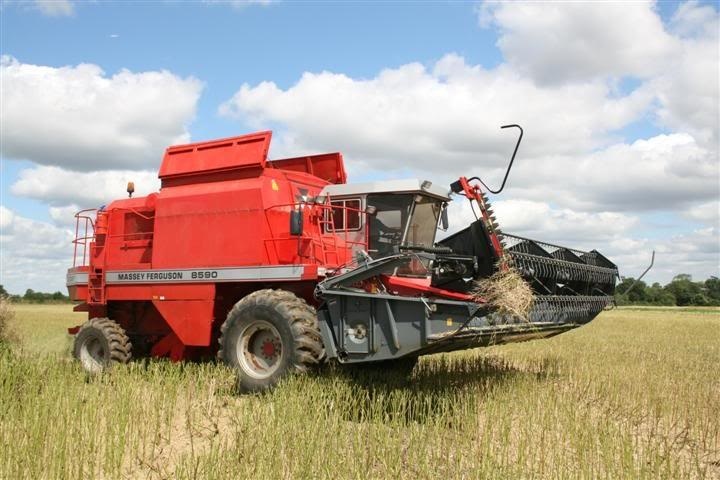 This very tidy 8560 with 4000 harvest hours sold for as little as $14000 dollars in 2013 in the usa it's a lot of combine for the money for sure!! This really is a special photo!! 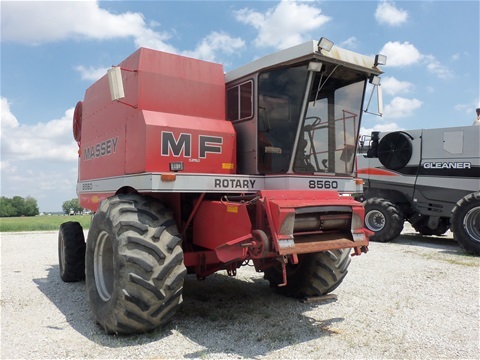 This 8590 rotary which belongs to custom cutter Marvin Helland stands next to the very first Massey 760 number 1 that left the Brantford production line in 1971!! This 760 was abandoned by the owner in this position 30yrs ago!! With a failed transmission !! And was left to the prairie elements which thankfully haven't caused to much trouble to the tin work as it would have here in Europe !! 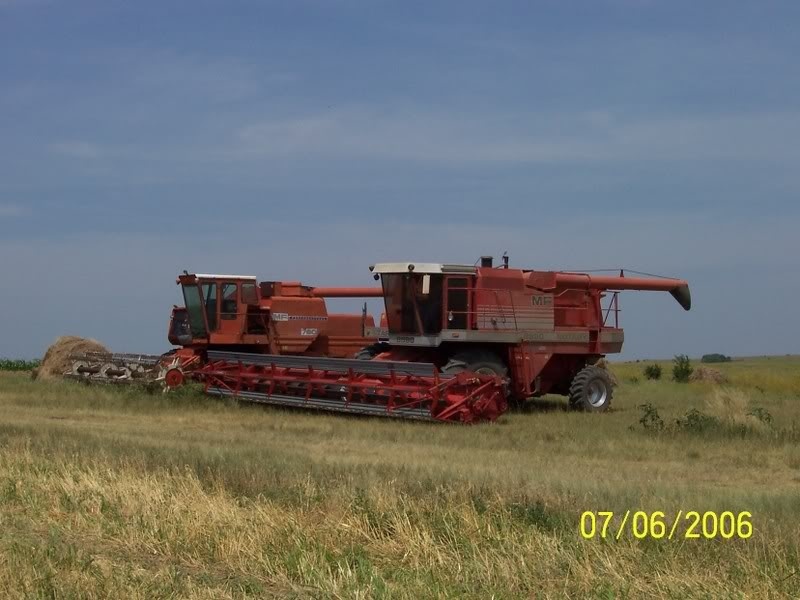 This combine would eventually be restored and used again by Contractor Marvin and Norfolk farming brothers the Clarke's more to come of this amazing story in the future. A true classic massey shot!! Any other colour just wouldn't work!!? 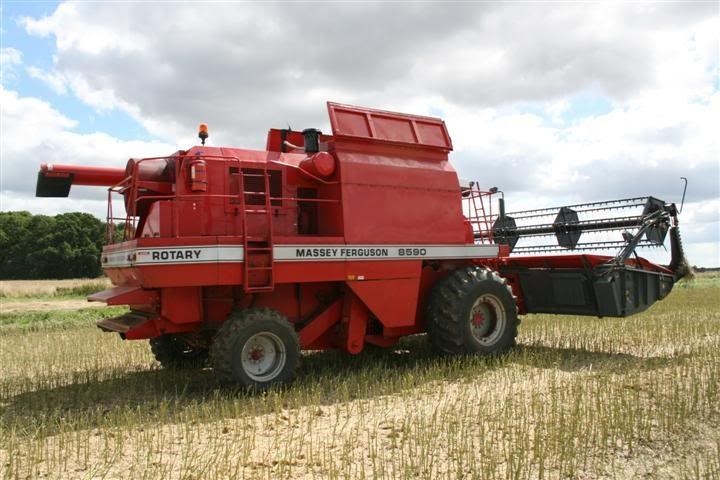 The Massey badged white rotary, the largest ever rotary combine produced in its day ! Picture copyright Chris Lockwood. 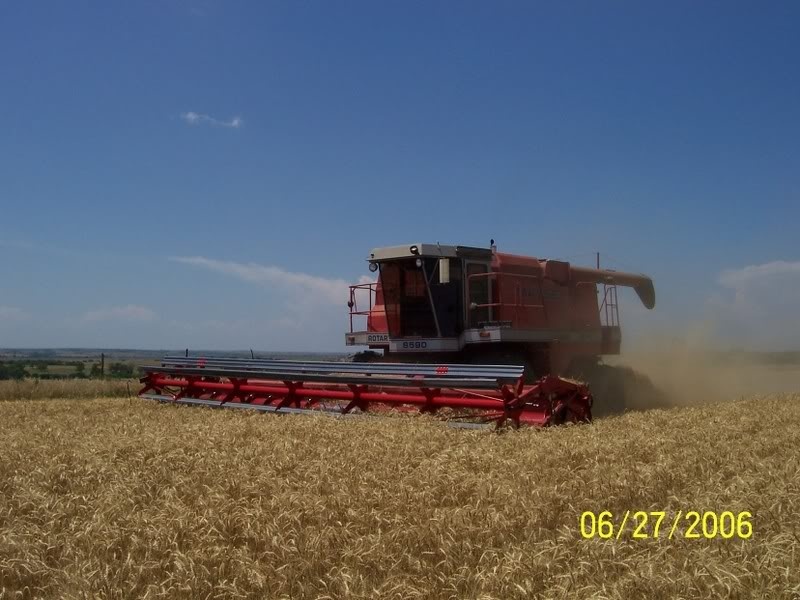 Hard to believe this is a 28 yr old combine!! Picture copyright Chris Lockwood.